The Paleo diet may well turn out to be the fad diet our decade is remembered for—never mind that it probably has very little to do with how our Stone Age ancestors actually ate. Now someone has dressed up the diet and bottled it—literally—so that Paleo dieters everywhere can also feed the paleo diet to their offspring. 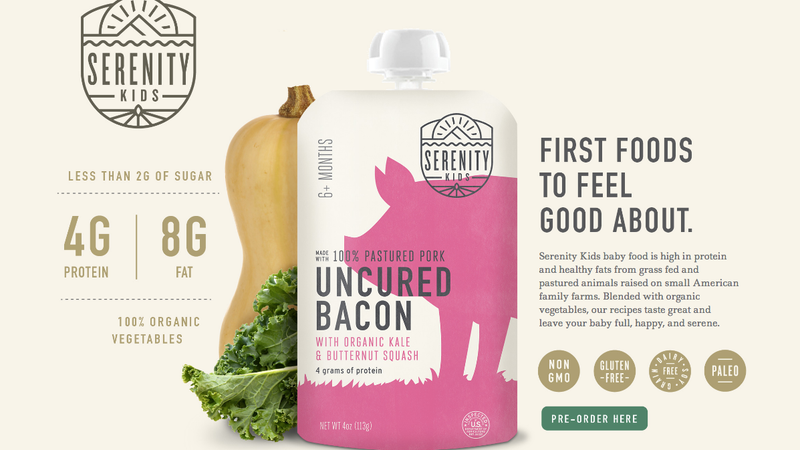 A company named Serenity Kids plans to launch this month with a line of liquid baby food that has the highest meat content of any pouched baby food on the market. Offerings for little cave babies include liquified uncured bacon with organic kale and butternut squash, free-range chicken with peas and carrots and grass-fed beef with kale and sweet potato. A pack of six 4-ounce pouches goes for $27. “I just couldn’t believe that nothing existed that would be something I would want to feed my own baby,” proprietor Serenity Heegel, AKA “Paleo Mom,” explained to Food Navigator. Now, there is something troubling about packaging a fad diet for babies. Paleo dieters stick to foods that supposedly would have been available to Paleolithic humans‚ the idea being that these foods are easier for our body to process. That means non-processed foods uncovered by foraging or killing animals for meat—so no dairy and no grains. The diet has faced its fair share of criticism. For starters, there is pretty significant evidence suggesting it’s nothing like like the diet actual Paleolithic human sustained. And while some research has suggested it may have health benefits and help with weight loss, at this point that work is still inconclusive, giving people little to rely on besides anecdotal evidence. None of that is to say that the diet is actually unhealthy. But some have suggested it might be when it comes to kids. In 2015, when Australian publishers sought to release a Paleo diet book aimed at new moms, health experts stepped in with concerns. Doctors said that the recipes contained ten times more vitamin A than is considered safe for children. The recipes also lacked other important nutrients. The book was never released. Experts have suggested that the diet’s restrictions on carbohydrates and extremely high levels of protein could hamper childhood development. Eating less sugar and processed foods sounds like a good idea, but it could mean kids aren’t kidding all the nutrients they need. “I do not advise parents to put their children on a Paleo diet,” Angela Lemond, a spokesperson for the Academy of Nutrition and Dietetics and registered dietitian nutritionist wrote in Food and Nutrition. You wouldn’t feed your kid Soylent or SlimFast right? Bottom line: Fad diets are probably not a great idea for babies.